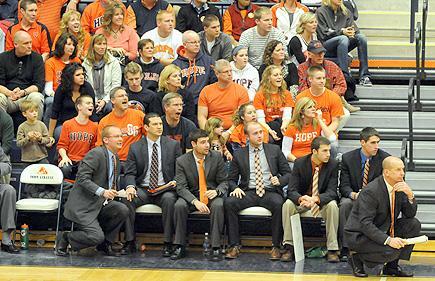 The Hope College men's basketball coaching staff will participate in the annual Coaches vs. Cancer® Suits and Sneakers awareness intitiave on Saturday, Jan. 28, when the Flying Dutchmen host Alma for the annual Winter Happening game at DeVos Fieldhouse. The initiative is a collaborative endeavor of the American Cancer Society and the National Association of Basketball Coaches (NABC). Coach Matt Neil and his staff will wear sneakers instead of dress shoes with their suits to demonstrate their support for the American Cancer Society and its vision of a world with less cancer and more birthdays. They will be joined by the coaches from Alma College. The sneakerrs to be worn by the coaches were donated by Gazelle Sports Stoe of Holland. to reduce their risk of the disease. For those who do not smoke, weight control, exercise and a healthy diet are the best ways to improve health and reduce cancer risk. Obesity has been shown to increase the risk for many forms of cancer, including breast, prostate, and colon cancers and may account for 20 percent of cancer deaths in women and 14 percent in men.